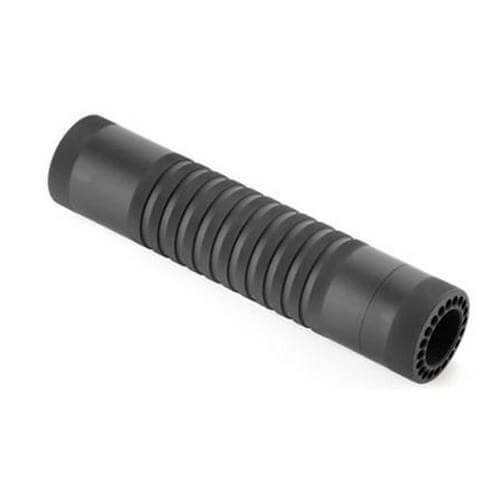 For a mid-length AR setup, you need the Hogue AR-15: Mid-Length Knurled Free Floating Forend – Black. Better performance for long range targets with this simple add-on. Standard barrel nut wrench won't work. The product itself is a good product and a good price. But it should be made so a standard barrel nut wrench can be used to tighten it to the receiver. The plastic crap wrench they send with is junk. I use the Hogue Free float handguards almost exclusively on AR builds due to the accuracy improvement, light weight & low cost. Don't get frustrated with the cheesy plastic wrench that is included. Toss it & install the barrel nut by wrapping it in Para cord that has a loop tied in the end for a handle. Will not mark the nut in any way. To remove the nut just wrap the cord in the opposite direction & use the handle. After installation I drill the front of the handguard & install a sling swivel & sling. The standard Hogue handguard does not require modification of the gas tube in any way which is required for the over molded version. Has some shipping issues and cosmetic issues. Ordered on 8-12-16 and delivered on 8-24-16. Not what I would call fast shipping. I did have to contact AT3 due to it not even being shipped until the 18th. I thought there might have been an issue, come to find out it ships from someone other than AT3 and they were slow at getting it out. If I could go back I would have paid the extra and bought it on Amazon with the 2-day shipping. As for the product it was okay, did not appear to be damaged but it had been opened. The forearm was dirty and covered in finger prints, nothing was missing. Other than those issues the product installed good and looks good. Oh and one other issue, I installed it on a midlength barrel with a Picatinny gas block and it does not close the cap, it is about a quarter inch too short and does expose the gas tube. Not a deal breaker but something to keep in mind. Item still in transit…thought the Pony Express was superseded 150 years ago. You need “Prime” like Amazon. Awesome deal high quality durable and comfort in this design best bang for the buck.